No topic more occupied the Victorian mind than Health. Many people still used traditional and folk medicines and remedies during this period and chemists also mixed their own tinctures and treatments according to local demand. 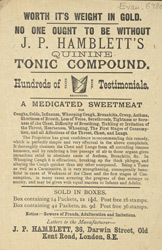 Chemists also stocked non prescription medicines like ‘Hamblett’s Quinine Tonic Compound’ that contained undisclosed ingredients and were advertised as curing a variety of ailments.